These cars, what few are left anyway, hold a special place in my memories. I had a beige one, which saw me through high school and my first few years in the United States military. 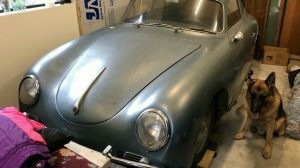 This one, though, is much nicer than mine ever was in my time behind the wheel, and it’s for sale right now, here on craigslist in Phoenixville, Pennsylvania, with an optimistic asking price of $2,200. It’s not a muscle or performance car by any means, but the fact that it has survived this long is something unique indeed. 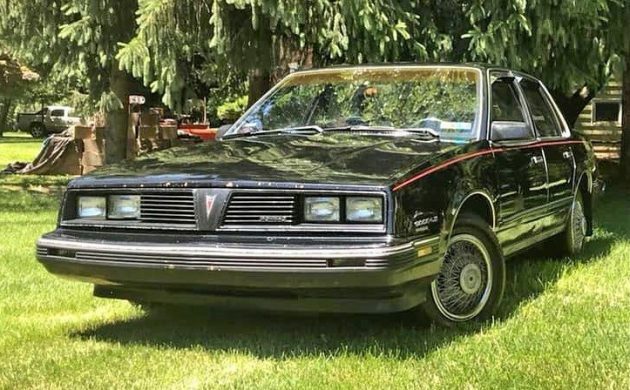 Anyone who remembers them also recalls their A-body cousins, the Buick Century, Chevy Celebrity, and Oldsmobile Cutlass Ciera. Neither the 90 hp 2.5-liter inline-4 nor the 125hp 2.8-liter V6 engine and three- or four-speed transmissions were getting you anywhere in a hurry, but I recall my V6 being quite adequate for both daily runabout and just-okay for long trips. I can’t imagine how tedious it must have been driving the optional 80 hp 4.3 Diesel engine! But let’s be real for a moment: I don’t believe they were meant to be much more than affordable mid-tier transportation in their day, and that’s okay – not every model of car is meant to be awesome. So, why this car? As I mentioned above, it’s a survivor – one of the “throwaway” cars from Reagan’s days that didn’t get treated like something disposable. It’s got a V6, front-drive automatic transaxle, velour seats with some controls on the steering wheel, the optional luggage rack on the trunk, and only 98,000 reportedly-original miles. 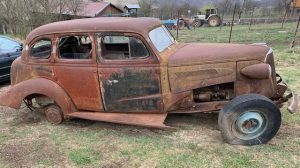 Additionally, the seller has a laundry-list of repairs which have been performed, and a couple of silly upgrades like a Flowmaster 40-series muffler. I’ve said it before that scarcity does not necessarily equal monetary value. Not that this car was ever rare to start with, again it’s the idea that nowadays, so few are left and Pontiac is defunct. It would never win in a regular show, but it could be a conversation-starter and would get noticed at a Radwood event. What do you think? Would you keep it as-is, maybe make it a 24 Hours Of LeMons car? Perhaps it would be a good first car for a teenager? It’s so hard to imagine that anybody ever found this car attractive. 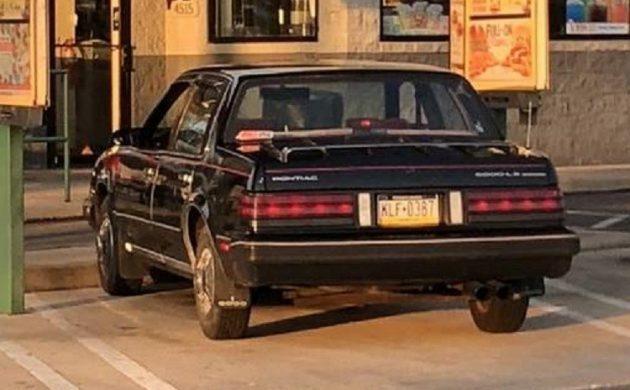 It represents a low point in automotive history for sure. Jason – in all honesty, they weren’t all that bad at the time. These were made for “the masses”, just a general everyday driver & as such they did fine. I got a lot of it’s siblings (Ciera, Lumina & Century)as rental cars back when I had a job that had me traveling quite a bit – usually picked by me as an “upgrade” once I arrived at my destination airport. I worked for a Pontiac Dealer when these first came out, we referred to these as GOOO, GOOOSE, GOOOLE & GOOOSTE’s throughout the shop. The STE’s really were the “Hot Ticket” of the Pontiac model – the post 86’s even more so. Wow, I just yawned so hard it made my eyes water! Find me a ste or even better an Ste wagon. Also brings back memories of high school you couldn’t kill these things. There is no such animal as an STE wagon, The 6000 SE with some of the “better” options was about as close as you could get. …and the window shade things–not sure what to call them. Although they are still around, mostly in SUV’s and some Subaru-ish types. They remind of the steering wheels covers we had to tie on with a knot. My family had an ’84 6000LE that I loved. We owned it for 13 years and no it wasn’t a corner carver or a straight-line strip burner, but it served us well. This brought back many happy memories. I still miss that car. GM eighties X car JUNK. Not an X car. These were ‘A’ cars. Based heavily on the X cars yes, but different and without the sloppy workmanship and long list of recalls. this was the GM A-Body not X. My sister had the STE version which actually handled pretty well. I had an 83 that was a good car to me. If it was closer at that price I’d have no issue throwing it on the road as a daily beater/commuter car. 6000’s were always the least common A-body from what I recall, the Celebrity, Ciera and Century were all more popular. If this was the rare 6000 STE it would really special, without that, this is just an average car that time has now made interesting because of its scarcity. 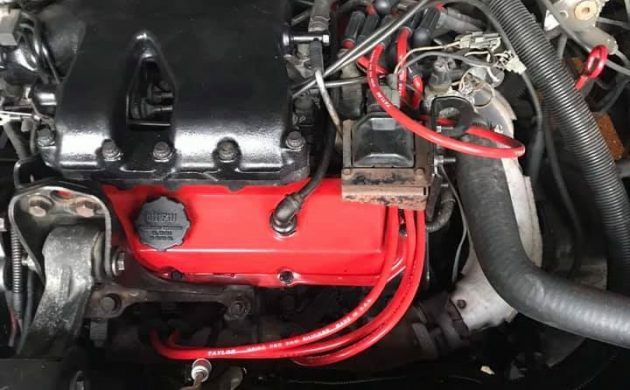 Too bad the owner decided to give it a Pep Boys overhaul, that red and black painted engine and non-stock wire caps are going to cause it lose points at Pebble Bleach……..
Mom’s STE was the first new car she ever had. She loved it. We kept it until the bottoms of the front doors rusted though..
I’d gladly put my neice into one of these. process. If I had the cash, my neice would be driving it right now. I would not put anyone of today’s teens in one of these. They would try to hot rod it all over the place just to try to show off. Better off getting them one of the Pacers advertised recently. Or an old Chrysler Corp slant six, geek mobile. 4 doors. 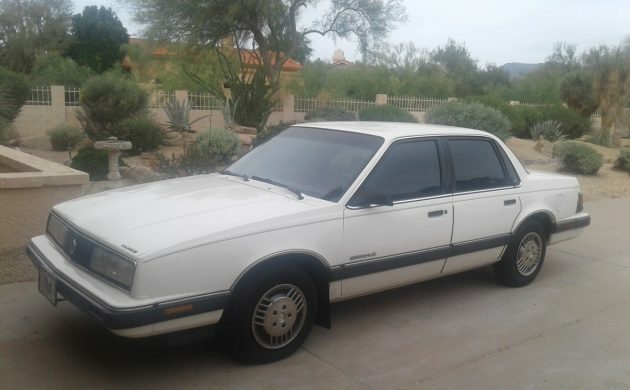 My parents bought one new in 1985 on the exact day I received my driver’s license. They turned around and gave me their ’77 Grand Prix for my 1st car. But the ’85 6000LE was the very 1st car I solo drove in on that day. I’ll forever love that car because it was my first taste of feeling free. I’ve driven a few of these. Least attractive of the A bodies I thought, but best exhaust note from the V6 and the interiors were a little more interesting as usual for Pontiac, especially with the steering wheel buttons. Much like the K car from the other, I don’t feel a need to ever drive another one of these, but I sort of miss the days when they were on the roads and someone should scoop this one up and get some use out of it. I had a 86 Celebrity Eurosport and loved it. I drove it into the ground, or so I thought, then sold it to a guy who drove it another 3 years. I liked the ride and it had enough power to highway cruise at speed. I wouldn’t hesitate to buy another. 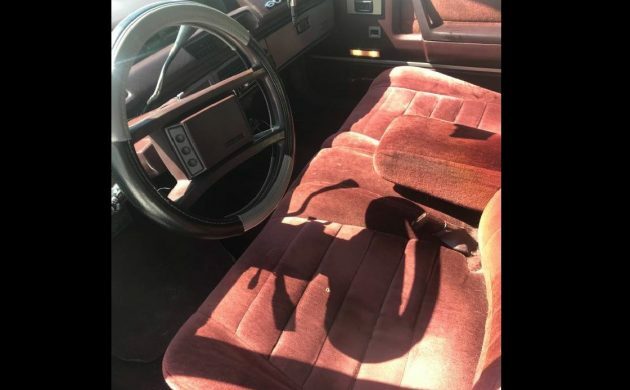 My Father’s Oldsmobile [84 Ciera, A Body 2.5 clone to the Pontiac 6000], sparked my interest in GM. I was very impressed by it when I first drove it. And decided I’d get something similar. 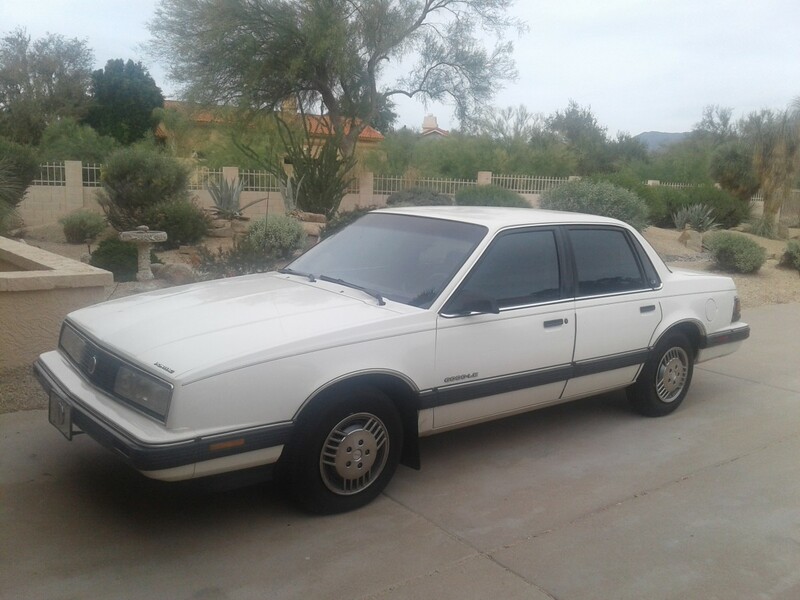 First an 84 Citation II notchback, then an 86 Olds Calais, which I still have. These were well trimmed, quiet, rode well, were fuel efficient, space efficient, and a reasonable size. It’s no wonder they were sold in Ciera and Century guise from 1982 till 1996. And from roots in the X Car no less. You can’t make this up. From 1988 to 1997 I worked for a major rent a car company. I managed some of the most difficult neighborhoods on Chicago’s south side. Lot of great people living there among a few who are terrible. Anyway, I was the only white guy for miles and that was fine. Around 1990 I had a customer come in and said “IFinnaRenUpOnAGooLe”. Being that I learned to speak a bit of Jive I quickly understood that he wanted to rent a specific something but what? After asking that question a few times and still not understanding I asked “the car you want to rent, do you see it on my parking lot”. With that he repeated again the line above pointing at a Pontiac 6000 LE !! Don’t even get me started on the guy who I said “your insurance company only provides an economy car like a Geo Metro”. His reply was “ok”. I said I did not have one at the time so I was going to upgrade him to a compact Geo Prism. His reply….NO WAY there ain’t NO WAY you puttin me into no car named PRISON. NO WAY !! “I’ll take the Geo METRA !! Tom, having grown up in the Chicago area I was intrigued with what you were going to say. Now LMAO! I won’t repeat some of my similar stories here. I don’t want to start a topping competition. I had a mechanic that worked for me that had one of these. It had over 350,000 miles on it. I asked him how many times he had to rebuild the engine or transmission and his answer was never. His wife had bought it new and it had been in the family ever since. And it never had broken. They were going to keep the car for ever. That was about 1998. I ran into Bill about a year ago and he was still driving it. He did a transmission rebuild on it 6 months prior at 485,000 miles. The car was now looking a little tacky. But not terrible. Waynr, I am glad I was able to give you a good laugh!! I have many stories from 10 years in the Rent A Car Biz. Your story is amazing. These cars back in the rental days were pretty bullet proof (not literally in Inglewood !!) but put gas in them and go! 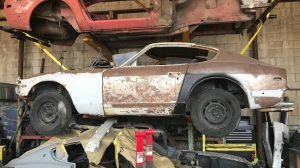 Too bad Pontiac is gone, he could probably sell it back to them when he hits 500K miles as a museum piece! Tom, We had a customer that was a courier that used her own car. When it hit 500,000 miles she brought us a 500,000 miles cake. Since we did all the maintenance on it. (Chevy Cobalt) She has since retired and still has the car, but only see her once in about 6 months instead of once every 3 weeks. 80,000 to 85,000 miles on tires also on that car. We had an audit from GM warranty at a time that I was a service manager at a BMW, Volvo, Oldsmobile Dealership. It seems my warranty expenses were past the line in the sand. What we found was that the only vehicles that were past the norm were the rental cars that we worked on. We were just down the road from an airport when Oldsmobile was “dumping” cars on the rental fleets to get them out of the factories. “Normal” owners would bring in their cars when the slightest problem would occur. But we only saw rental cars when they would no longer motivate under their own power. Replace rather than repair was usually the mantra when the rental car companies were very eager to get the cars back. I spent my time with Enterprise and we (they) were always good about getting things fixed. When I worked there we kept the cars about 18 months and 30K miles and to the auction or an E car sales lot they went. If a light came on, on the dash, they had to go in. Very hard to rent a car to someone, and understandable, when a check engine light or something is lit up. We would buy hundreds/thousands of cars at one time of ALL makes and models. Honestly, my opinion, I learned that ALL cars (even though I am a GM fan) are basically GOOD cars BUT there were specific cars (meaning by VIN) that we “chronic” in the shop cars SO….the saying of (and this goes for all makes and models) was it built on a Monday (ee’s hung over) or a Friday (hurry up and build it so we can get out of work and party) is MORE TRUE than most know. I firmly believe that. We could buy 100 Taurus’s , 100 Lumina’s, and 100 Intrepids and 98 of them were, put gas in them and go. change the oil. Never an issue. the 2% (meaning the SAME 2 cars out of that 100 by VIN) always in and out of the shop throwing check engine lights.etc. That’s a great story also Tom. I guess working for a rental agency like that gives one a “birds eye” view of the auto industry. I have a 91 Pontiac 6000 LE last year for this car. 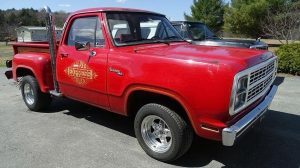 The car is all original paint shines and interior all in great cond no fading always been garaged and has 67,000 miles. Have done normal wear and tear repairs car drives great and the V6 has great power. Its a unique car that is not seen. Nice car Adam. A lot of naysayers for this era cars. It I’ve always been a fan. Of course I’ve always bought them used and paid much less for them. Thanks I do too like these are cars and down the road buy others to collect. They may never reach a huge value but 70s 80s and early 90s are better then today’s cars are they look unique and they stand out. Still listed. And I don’t see what is so ambitious about $2,200.00. But, to each his own. I really think this is a pretty good daily driver. Not real expensive. Parts may be hard to find, but, I think it is in the “drive it until it quits” category. Then, get a new one.